There is a choice of clean, comfortable private rooms and mixed dormitories to rest your head. Relax in one of the many communal areas; a rainbow rug draped, pumpkin adorned (yes – it is Berber decoration) courtyard lounge where breakfast is served and entertainment is spontaneous. Share the sun on the terrace with new friends and the odd inquisitive tortoise, or seek the shade in the Berber tent with a view (and satellite TV). Defying the winding staircases, our staff will bring you tea, coffee and shisha all day and all night long; the views are amazing and the company is marvellous! We regret that credit cards are not accepted. 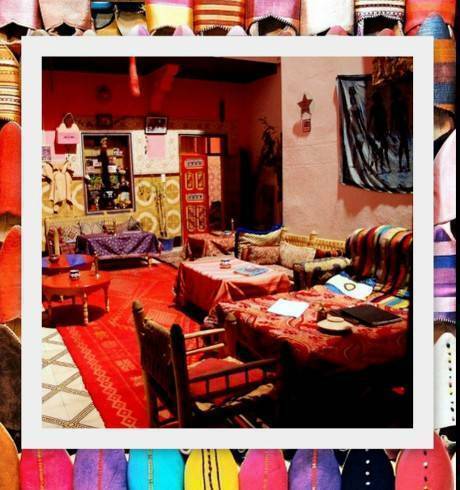 Riad Marrakech Rouge is full of spaces to rest and relax after a hot day in the organised chaos of Marrakech. We have a large open courtyard, and three terraces with a welcome breeze and fantastic views. The first terrace is next to Salon Shishawa - a large communal salon - with views and sounds of the street below. The large roof terrace holds views of the Koutoubia mosque - particularly spectacular at night, accompanied by the music of the main square, and smoke rising from its many food stalls. The third terrace is raised from here and contains a large Berber tent. 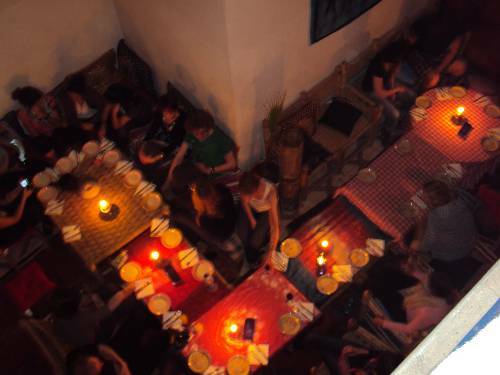 We offer drinks, food and shisha pipe to create a relaxed and friendly atmosphere. It is possible to access wi-fi from these spaces and is free to guests. On arrival, guests can have free use of our traditional hammam on the terrace or sip complimentary Moroccan tea in our court area. Chambre Francesca -A large suite with private shower room opening into the court area on the ground floor. 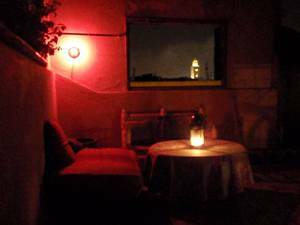 Riad Marrakech Rouge is situated in the centre of the souqs next to Place D'Jeema E Fna. 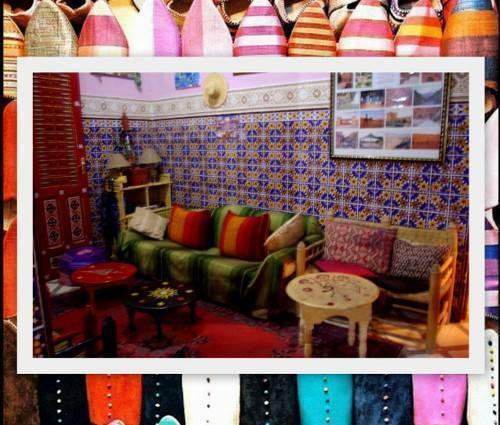 It is also only a few minutes by foot to major attractions such as Palais Bahia and the Mellah - the Jewish quarter, famous for its spice markets. Less than 24 hours notice of cancellation will result in guests paying the full amount to the hostel. 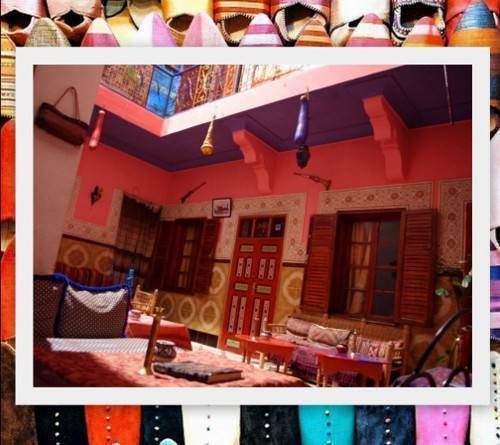 Walk straight on and through a traditional Moroccan archway - continue straight on and through a second archway - take the first small street on the right, immediate left and you will find Riad Marrakech Rouge at Number 40. We can arrange pickup from bus station, train station and airport. There is carparking nearby, and we are very easy to find on foot!